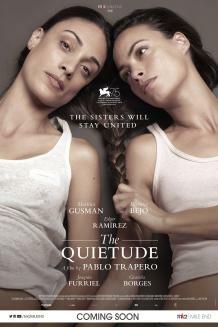 “Two sisters from an affluent family re-explore their unusually close bonds in The Quietude, Pablo Trapero’s beautifully crafted multilayered drama. Boasting a trio of actresses at the top of their game and cinematography with confident yet unshowy fluidity, the movie deftly enters into the bosom of a family harbouring multiple secrets, encompassing the personal and political. Set in pristine flatlands surrounded by a stunning flower garden, La Quietud is a coral-colored dream ranch. It’s the home of counsellor Augusto Montemayor (Isidoro Tolcachir), his wife, Esmeralda (Graciela Borges), and their younger unmarried daughter, Mía (Martina Gusmán), living an outwardly perfect life until Augusto has a stroke and older daughter Eugenia (Bérénice Bejo) flies in from Paris to offer support. The similarity between the sisters is uncanny at first.